Finally, we’ve reached the fourth and final race of the Daniel Island Series. I didn’t have too many ambitions about this race. I wanted to finish strong, but I had pulled a muscle at the previous race. I worked on it, though. By the time of this race I was back into my longer runs. Since the marathon loomed in my future, I decided to train a little extra on the day of the race. I ran six miles before sunrise, and rested up at my desk job. I had no intention of pushing myself during this last race. I still did it, of course. I ran like hell. The incessant Hurricane Fay was still sending waves of weather all the way up the coast. All week we were getting these flash-bang rainstorms. We got blasted for twenty minutes, then it would stop for a while before starting the whole thing over again. I wasn’t crazy about running in heavy rain again. I don’t mind the water, but my shoes tend to gain weight during the race as they soak up water. Also, they seem to stay wet forever. After a while, the rain/sweat combination becomes too much, and I have to toss them into the laundry. Lastly, there’s the grass to consider. 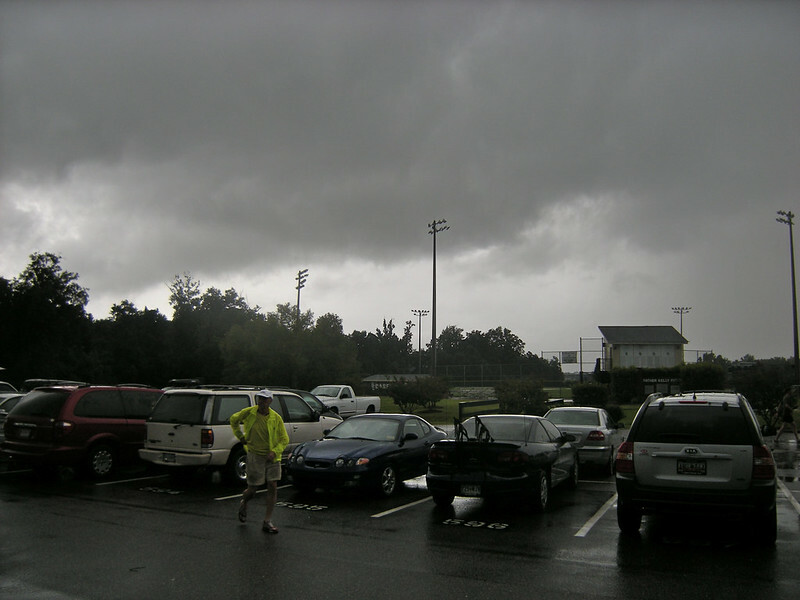 We start at Bishop England High School near the baseball field. At the start and finish of the race, we have to go over grass, which can be slippery if the ground is wet. Nobody wants to wipe out, but if you’re extra-careful then you lose speed. It was pretty much the same crowd from the rest of the series. Below you’ll see a photo of myself with Donna and Joan. These were taken during one of the precious breaks in the rain, in some of the better light. The course was no different from the other three events in this series. we exited the high school grounds and entered the neighborhood. The locals knew that we were going to be there, but we didn’t have the authority to shut down the streets. Basically that meant that we were guests of the neighborhood, and we should clear for the occasional car. Fortunately, the cars were rare and very aware of us. We had no problems in that area. There were several points during the race where I felt a little sick. I blamed it on the morning run and slowed down a bit to let my stomach settle. I had myself figured for 23 minutes and change, until I approached the turn-around point and noticed a familiar blonde behind me. Her name was Susan, and she’s the one I finished when I set my personal record. I had really punched it during that race, passing her and leaving her a half-second behind. Assuming that she was going at around the same speed as last time, I could break 23 minutes again by staying ahead of her. I let her pass me, and rationalized the decision. I was tired from that morning, I was feeling a little sick, she’s better trained, etc. After maybe half a minute I reconsidered. She’s not better trained… she’s almost exactly the same speed as me , but without the stubborn streak. If I could get ahead of her I could possibly score another Personal Record. So yeah, I sped up. Just a bit, though. It took some time to catch up with her, and we were on the last tenth of a mile when I overtook Susan. I passed her at a steady pace and increased the lead as much as I could. It wasn’t really about Susan, of course. It was about the Clock. I wanted to best my PR, and she was a known quantity. She finishes in just under 23 minutes. Stay ahead, and so will I. Well, it worked. Once again I punched it on the home stretch, giving all of my remaining energy to the finish. I was apparently a little reckless about it, because my foot slipped in the grass. No worries, though. My right heel went forward, I dropped down onto my left knee, and I slid for a moment until my heel gained some traction. When the shoe finally dug in, I popped back up as if I was sliding into Third Base. That wasn’t just my observation, either. As I left the Finish , some of the guys started making baseball jokes. We all got a chuckle or two out of it. Oh, yeah… there was a party. Budweiser was available, and an incredible amount of pizza. I attacked the pizza ferociously, and I even tried to drink one of the Budweisers. Really, I did. They were nice enough to provide it, but it wasn’t Guinness so I had to stop at one. As we waited for the awards to be handed out, the sun finally set. I had forgotten how late it was. 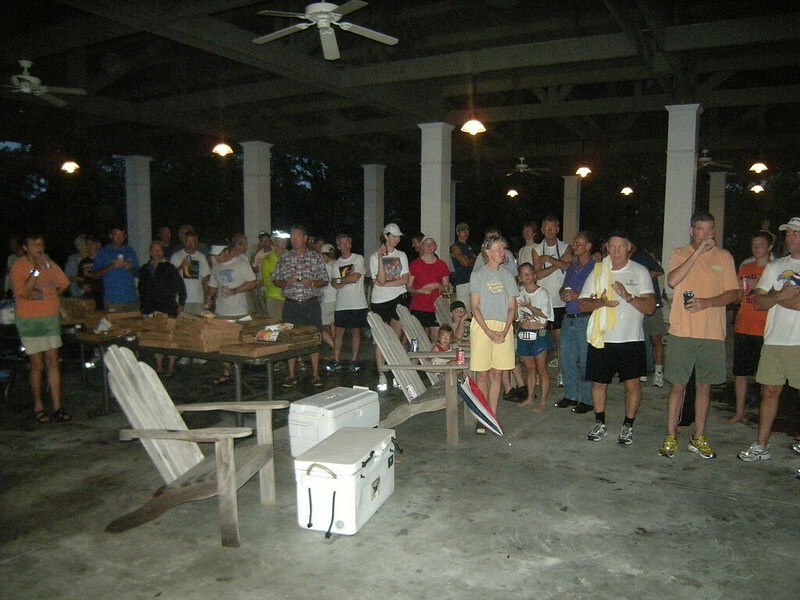 The awards were pretty standard, although it’s worth mentioning that Donna Brown won first place in her age group. That’s right, she ran faster than any of the other 72-year-old women there. You go, girl. 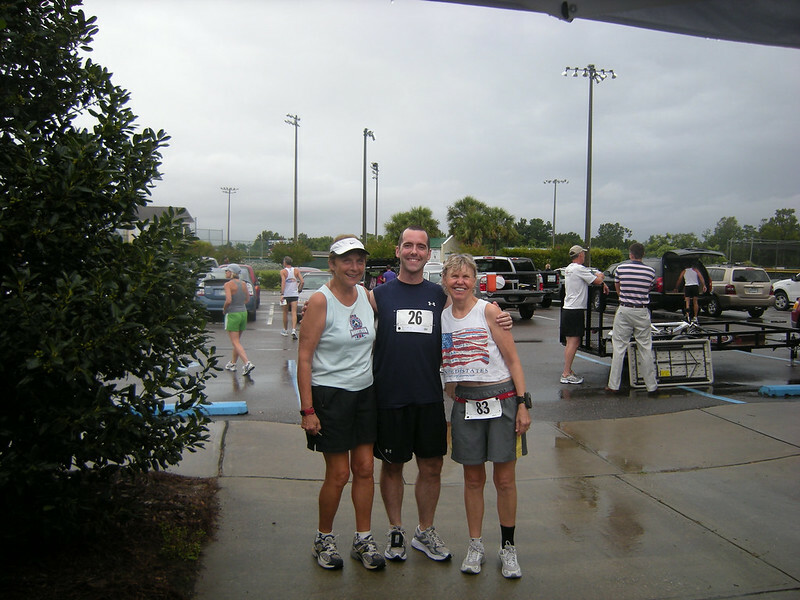 I had made a new friend at the final race, so I sat with her and talked about… well, running . What else are we going to talk about during an awards ceremony for a running event? I waited to post this article until I my time was posted. After two days, the results are in and I can see that I missed setting a new Personal Record by two lousy seconds. That’s right. 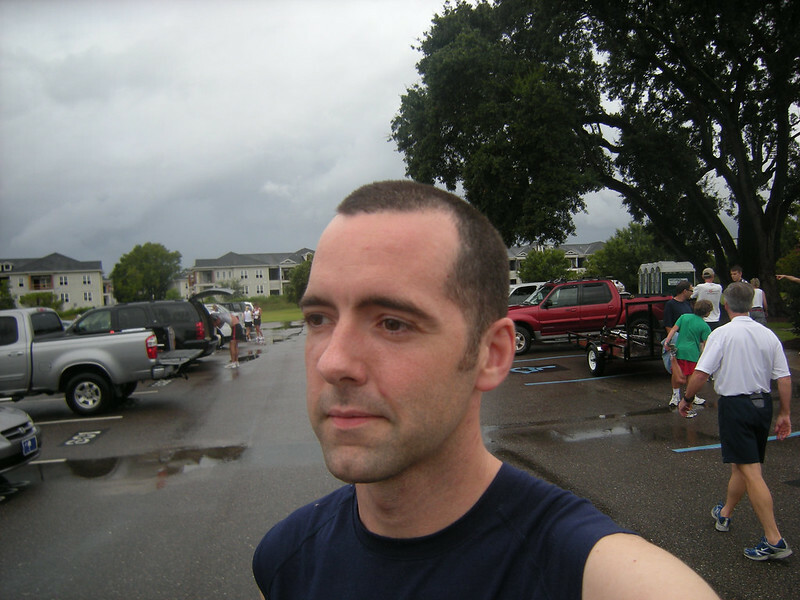 I finished in 22:49 , but my record for a 5K is 22:47 … which was set on this very course. Dammit all to hell. I felt sick because I was going fast, not because of the run that morning. If I had skipped the water station, I would have made it. Still, I suppose I can’t complain. I still got under 23 minutes on a day when I ran twice. That’s not too shabby.